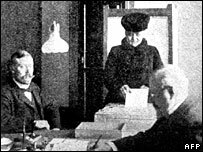 One hundred years ago, Finnish women became the first in the world to have unrestricted rights both to vote and to stand for parliament. In elections the next year, 19 female MPs were elected and women have continued to play a central role in the nation's politics ever since. 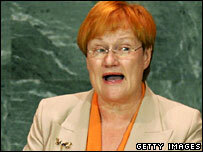 A century on, Finland's female President Tarja Halonen has just been voted into office for a second term and women's representation in parliament stands at a healthy 38%. 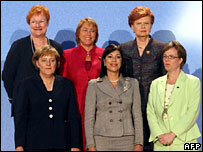 Meanwhile, many nations in Europe and across the world trail far behind in terms of gender equality. Italy, for example, is the worst performer in the EU, with only 11.5% of parliamentary seats filled by women. Worldwide, the average is only 16.6%. As Finland's Foreign Minister Erkki Tuomioja told Associated Press: "We're not perfect, we have a lot to do still, but we are an example for the rest of the world." So how did Finland become a trailblazer for women's political rights? According to Finnish political commentator Olavi Borg, the catalyst for change was a radical overhaul of the entire Finnish electoral system. On 1 June 1906, Finland's parliament extended full political rights not only to women but also to all men, rather than an elite few. "Before this reform 70% of all adult people were outside suffrage," Professor Borg, formerly of Finland's Tampere University and an MP in the 1970s, told the BBC News website. "It was a revolution by law." The change came at a time when Finland, controlled by Russia until it gained independence in 1917, saw an opportunity to increase its freedom amid Russian upset following military defeat by Japan. Meanwhile New Zealand and Australia were also pioneering women's rights. The former gave women the right to vote but not to stand for election in 1893, while all Australian women bar Aborigines were given the right to vote and stand in federal but not state elections in 1902. However, it would be 38 years before France gave women the vote and 65 years before Switzerland followed suit. According to Kareen Jabre of the Inter-Parliamentary Union, women's rights can often be boosted as a result of more widespread political upheaval. She cites the examples of Rwanda, Burundi, Iraq and Afghanistan, where new political constitutions drawn-up post-conflict have greatly improved women's political status. Rwanda, where quota measures are in place, now tops the global table for female parliamentarians, with 49% of seats held by women. But, Ms Jabre said, there is still a long way to go in most parts of the world, even where women have had the right to vote and be elected for decades. Of particular concern are many Arab and Pacific countries - apart from Australia and New Zealand - where women's representation is very limited, she said. This is partly down to strong cultural traditions and partly the result of political rules historically written by men which make it hard for women to win their way to power. "What is very clear is that the gap between having access or being granted the right to vote and making it to parliament is quite big," Ms Jabre said. "It's not the case where you have this right that women will make it immediately to parliament. That throughout history has been quite striking." However, there are signs of progress. Several countries have recently elected their first female leader - Liberia, Chile and Germany among them - and women in Kuwait are preparing to vote and stand in parliamentary elections for the first time later this month. "The image of women in politics is changing. 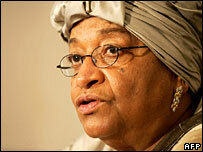 There are a lot of positive signs and I think the evolution is going to speed up in the coming years," Ms Jabre said. Prof Borg believes the secret of Finland's success on this front, as with its Nordic neighbours, is a long-standing cultural tradition of gender equality. And having equal female representation in the Eduskunta, or parliament, has brought obvious advantages, he said, not least in creating Finland's enviable social policies. Speaking to some 100 international guests on the hundredth anniversary celebrations for Finland's parliament, President Halonen was clear that universal suffrage was a right worth fighting for. "Even though we have cause to celebrate today, we should remember that maintaining and improving the democratic system is a never-ending process," she said. "Democracy can only become reality if citizens are interested in and prepared to participate in the decision-making concerning matters common to us all."